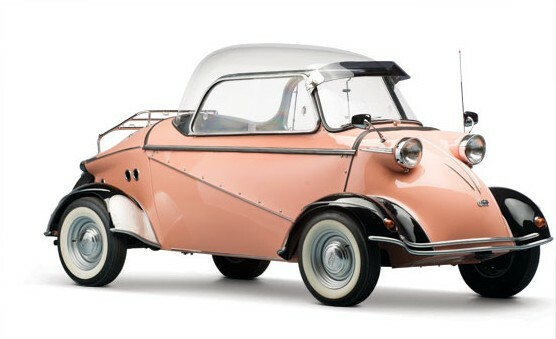 Known as the “Tiger,” this Messerschmitt-based car differs from its base car in that it has wheels at all four corners, as the Messerschmitt was only a three-wheeler. FMR stood for “Fahrzeug- und Maschinenbau GmbH Regensburg.” So yeah, “FMR” is way easier to say and fit on the fender. Built from 1958 through 1961, the Tg 500 (Tg stood for “Tiger” but Tiger was trademarked by someone else) used a 494cc two-cylinder making 19.5 horsepower. Top speed was 78 mph and – and this is the first car I’ve come across from this sale that is capable of such a statistic – a 0-60 mph time of 27.8 seconds. Yes, that might seem like an eternity, but hey, it can actually do it. Only 320 were built and apparently they are highly desirable today, as this one has a pre-sale estimate of $125,000-$150,000. Check out more here. This entry was posted in Uncategorized and tagged 1958, auctions, cars, classic cars, fmr, microcars, rm auctions, tg500 by classiccarweekly. Bookmark the permalink.